Assuming we have a right handed QB, the pressure and rush should come from the side that he likes to roll out to. Most right handed QBs will roll out to their right (the defense’s left) and we need to be able to contain that effectively. In the above illustration, we have a right handed QB with the blue arrow indicating the way he usually likes to roll out. If the defense brings pressure up the middle, he will escape from them and find a way to roll out to the right. This is a natural tendency for all QBs. In fact, in organized football, this side is usually the strong side or play side, meaning the side we prefer to use. It’s easier for a QB to throw on the run if he rolls out to the side of his handedness. So if you have a right handed QB, you can throw him off his game by bringing the pressure form the side he likes to roll out to. 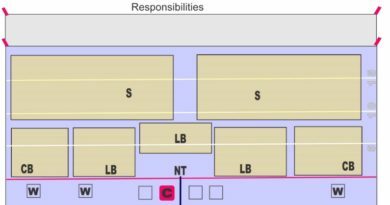 Above, we have the LBs lined up way to the right of the illustration (far left from defense’s point of view) and have them bringing pressure from that side only. In flag football and backyard football you can do this and it will immensely confuse and aggravate the QB. Very few QBs (Joe Montana, John Elway, Dan Marino) can throw across their body and be accurate and strong. So if you manage to flush the QB to the left side and he has to make a throwing motion, it will be easier to intercept the ball. You can modify this by sending in the CB as well, labelled CB2 above on a blitz. That way you have three coming in. Also, you can go all out and send in LB3 as well and just leave the middle open. The safety will have to cover it and the other CB will have to be playing short and deep. It’s a gamble, but it’s well worth it. If the QB is a left handed QB, then just flip everything above and bring the pressure form the left side (defense’s right). The QB will be so confused and frustrated that you will have accomplished your goal.